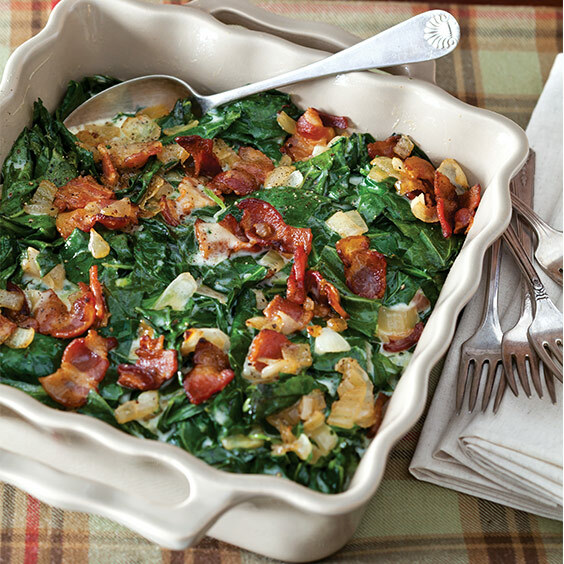 These Creamed Collard Greens are bursting with smoky bacon flavor. Preheat oven to 350°. Spray a 2-quart baking dish with cooking spray. Bring a large Dutch oven filled with salted water to a boil over medium-high heat; add greens. When water returns to a boil, immediately drain greens, and transfer to ice water to stop the cooking process. Drain and squeeze dry thoroughly. In Dutch oven, cook bacon over medium heat until crisp, 5 to 7 minutes. Remove bacon using a slotted spoon, and let drain on paper towels, reserving drippings in pot. Add onion to pot; cook until golden brown, 3 to 4 minutes. Whisk in flour; cook for 1 minute. Whisk in cream and broth, and bring to a boil. Cook, whisking frequently, until thickened. Stir in greens and bacon until well coated. Spoon into prepared pan. Bake until hot and bubbly, 20 to 30 minutes. Sprinkle with pepper. Let stand for 5 minutes before serving.